Press Release | WARDHA: On the 68th Martyrdom Day of Mahatma Gandhi, Navdanya will join Gandhian organisations, activists, ghani operators and farmers at the Magan Sangrahalya and Gandhi Ashram in Wardha, to launch a satyagraha to defend Gandhi’s Ghani (Ghani = a traditional method of oil processing in India). The ghani was served a notice in 2015 under the corporate driven regulations of the new FSSAI Act which replaced the Prevention of Food Adulteration Act 2006. Corporate driven Trade and Pseudo safety laws that create MNC monopolies. 13,31,600 ghanis and 20, 000 small extraction units have been the mainstay of our oil economy, meeting 68 percent of our oil needs. In the early 90s MNCs like Cargill wrote the WTO rules including the agreement on agriculture and SPS (sanitary and phytosanitary agreement) bon Food safety. The 2006, FSSAI is implementing of this WTO agreement. 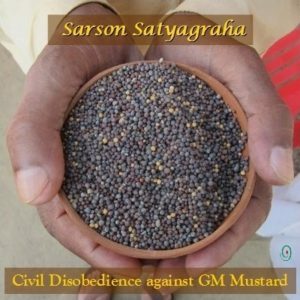 Even before our laws were changed, the corporation manipulated the closure of our ghanis and destruction of our desi sarson and oilseeds to start dumping GM soy oil on Indian markets. In 98, the MNCs got a packaging order passed with required every ghani to have a lab and two chemist with a packaging plant. 5 Lakh ghansi providing pure healthy oils to India were shut down. That is when Navdanya launched its first sarson satyagraha to defend India’s rich oilseed diversity and bring back the ghanis. Not only are corporation like Cargill and ADM destroying our agriculture they are also destroying our health. 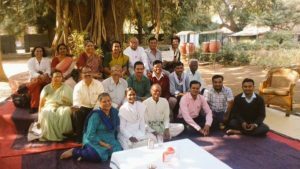 The ADM Maharashtra public private partnership has enabled ADM to buy soy bean at half the MSP thus leaving soybean farmers destitute. Cargill which is importing GMO Soybean as well as Palm oil has also bought up Indian brands. Cargill Foods India is engaged in processing, refining and markets a wide range of indigenous and imported edible oils, fats and blends to the food industry including Sweekar, Sunflower Vanaspati, Leonardo range of Olive Oils, Nature Fresh, Gemini, Rath and Shakti Indian brands of edible oils. Soy oil is extracted at very high temperatures using solvent extraction plants which heats the oil upto 400 C and use hazard chemical such as hexane in the process. When n-hexane is ingested, it causes nausea, vertigo, bronchial irritation, intestinal irritation and other adverse Central Nervous System effects. Plus they also actively facilitate GM Soy oil dumping on India. None of this Soy oil is tested for safety of human consumption. A larger issue puts the health of Indian at jeopardy as all industrial edible oils are allowed to be blended with 30 percent of anonymous “vegetable oils” including Bt Cottonseed, etc without any testing or labelling. GMOs in foods is illegal in India. The Food Safety regulation treats ghanis and other small traditional oil extraction units at par with large industrial solvent extraction plants and demands that ghani operators attach a lab and two chemists or else shut down. This requirement robs India of its only source of pure and healthy oils , while allowing corporations to sell unsafe oil without honest labelling . Corporations with labs have a record to false claims and manipulated data . While pushing unsafe untested oils on India Cargill is sponsoring public relations campaigns on “Food safety” in the country with a clear aim to attack our ghanis and artisanal food processing sector which provides employment to millions and safe food to all. If under the FSSAI regulations all the traditional Ghanis are shut Cargill will gain maximum profit from it. We have to rekindle the spirit of swadeshi and swaraj on the martyrdom day of Mahatma Gandhi and fight to keep his vision and ideals alive for the livelihoods of our farmers and small processors, for our national health and well being , and for our food freedom in times of corporate food imperialism. Was served #Soya in a canteen in #Kerala Mentioned the anti nutritive & antifertility factors in soya . Canteen immediately banned it . 54 Comments to "Satyagraha for Gandhi’s Ghani"